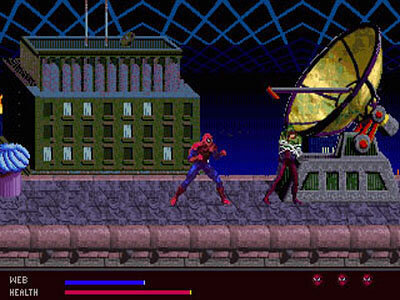 The Amazing Spider-Man: Web of Fire is an exclusive, late-release action game for the 32X. Your mission in the game's ten stages is to stop Hydra's electrical plasma grid from wiping out New York City. At your disposal are a few attack moves such as a web blast, running kick, and a combo of punches; collecting icons in each stage also allows you to call in your super hero ally Daredevil to wipe out everything on screen. Unfortunately the controls are extremely slippery and Spider-Man moves too quickly; this results in frequent and accidental contact with enemies and dangerous objects no matter how delicate you are with the d-pad. Spidey also has a habit of sticking to the scenery, usually when he's in the neighbourhood of an electrical fence or generator! The collision detection is slightly off too, and despite taking lots of unfair damage the game doesn't even have the courtesy to refill your health after each stage. The combat is unspectacular, and the lack of moves void any real attack strategies. Some enemies take forever to beat and like in Wild Streets (1990, Amstrad GX4000) your best bet of staying alive is to jump over them and keep running! The level design is repetitious (with the same assets and sections reused multiple times), and some stages are so poorly constructed that they allow you to skip large sections by clinging to the ceiling! There are a couple of standouts from an aesthetic point-of-view though, such as the battle on the George Washington Bridge, and on Hydra's Airship where you can see the scenery passing by the windows! However, the bosses leave a lot to be desired, and defeating them boils down to mashing buttons rather than pattern recognition. The Amazing Spider-Man: Web of Fire is a real missed opportunity, as the level design and combat wasn't refined in any way, shape or form. With a little more care and development time this could have been a great late release in the console's library, but irritatingly it's yet another 32X game that's undercooked. Random trivia: A debug mode featuring a level select can be accessed by inputting a button combination on the opening screen.